Preheat the oven to 190°C. Place the sweet potatoes onto an oven tray, and bake for 50-60 minutes, until tender (test with a pointed knife in the side). Remove from the oven, and when cool enough to handle, cut in half horizontally. Scoop out the flesh, leaving about 1 cm in the skin. Mash the sweet potato with a fork, and add the corn, tuna and parsley. Stir in the eggs, and season to taste. 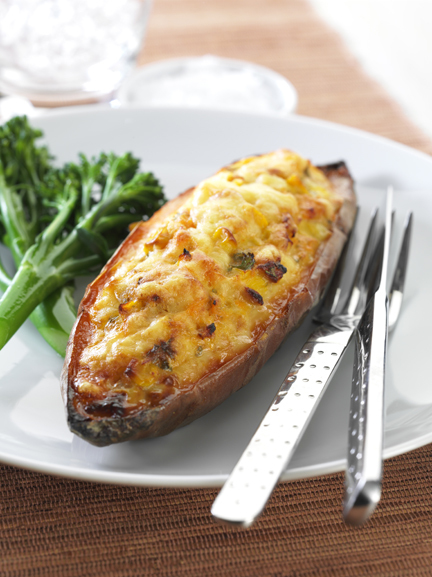 Place the sweet potato shells onto an oven tray lined with non-stick baking paper. Spoon the mixture into the sweet potato shells (if the shells are very soft, prop the sides with a little folded foil). Sprinkle cheese on top.